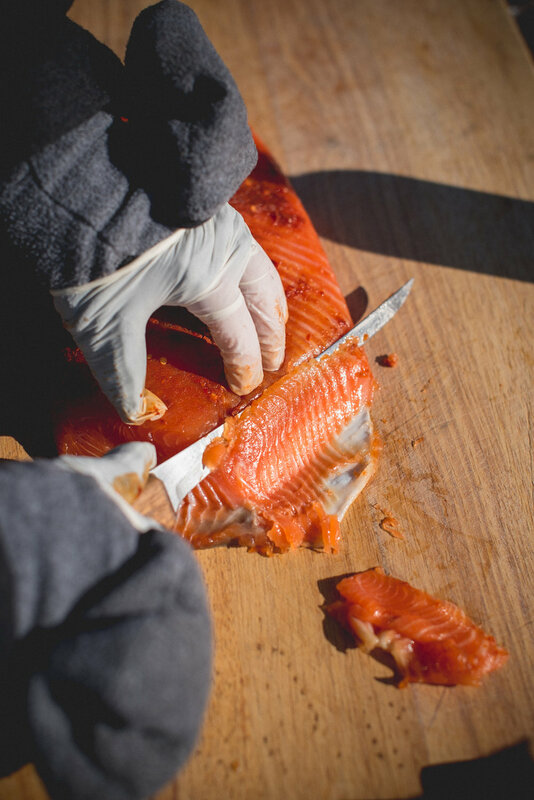 On a chilly, but clear day right in the middle of winter last January, the Bacon & Lox Society hosted a truly one-of-a-kind event: our first-ever Ice Dinner. 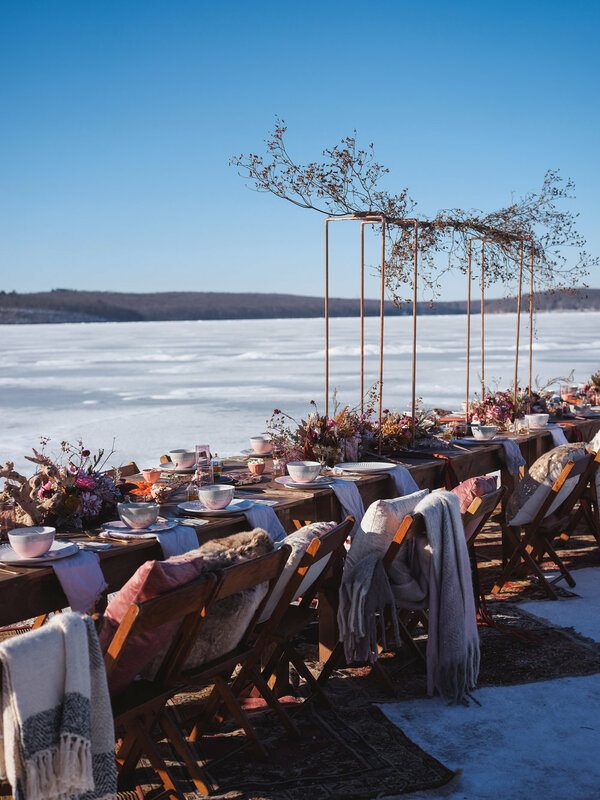 Our hearts full of intent to celebrate the uniquely stark beauty of winter, we set up our communal table on a frozen lake, inviting 30 of our closest friends, loved ones, and collaborators to contribute to what would be a truly unforgettable adventure. Read on, and learn more about our inspiration, and how we implemented our vision! Growing up on Maui made it easy to appreciate the outdoors year round. The Pennsylvania winters...well, they’re another story. And while I love my surroundings and community, I found myself worrying: Was I simply “getting through” each winter? Was I doing my best to appreciate for what it is, rather than just figuring out ways to make the months go by? I wanted to make sure I was truly appreciating this part of the year for the unique things it had to offer, which led me to the next question: What could I do to trick myself, in a way, into celebrating and thriving in those coldest, darkest days? It was this thought that sparked the initial inspiration for an event which would eventually grow into the Ice Dinner. 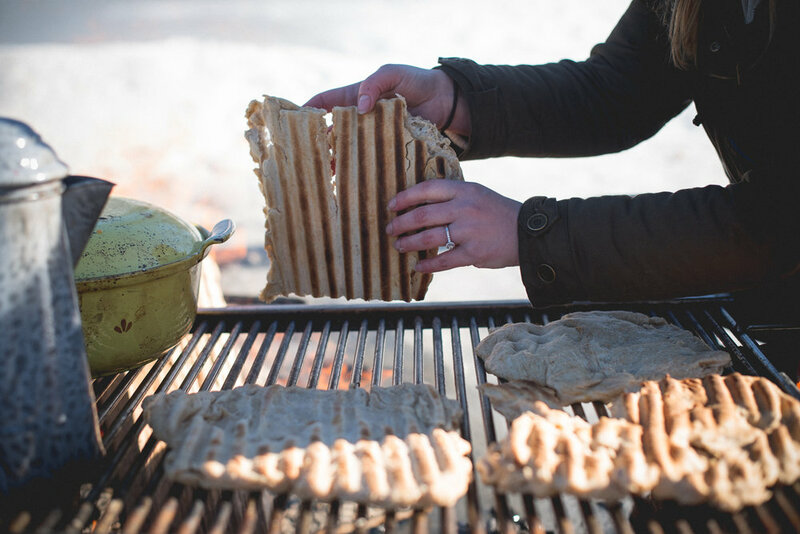 Planning an outdoor event is never simple — you’re literally at the mercy of the elements! There’s a lot that can go wrong at the drop of a proverbial hat...but you face a whole new set of obstacles when you plan a gathering smack in the dead of winter. Rather than anxiously watching the thermostat drop, though, I found myself cheering for the cold weather that had successfully driven me indoors so many times in the past. No longer! Thick ice was essential in providing a strong foundation for our communal table...the deader the dead of winter, the Icier the Ice Dinner would be. As the temperature rose and fell, icy rivers thawed, buckling and creating jams that would certainly gum up my plans. I realized quickly that I had to adapt. Flexibility would be a necessity. As the date loomed, rescue arrived in the form of my good friend Justin Genzlinger generously offering to let us to use the Silver Birches Resort in Hawley, PA, as the backdrop for our dinner. We settled on the perfect scenic patch of ice on Lake Wallenpaupack. Now, all we had to do was simply hope that the temps stayed low and the stark environment would welcome us when the time came to gather together. 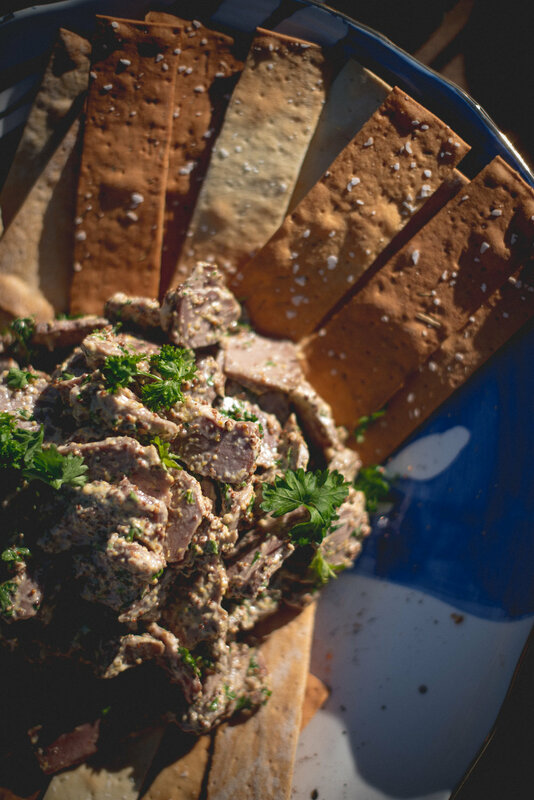 In order to implement our vision, The Bacon & Lox Society looked to the concept of Hygge. This Danish word encompasses the concept of rituals that promote comfort, togetherness, and appreciation, and was integral in helping us foster inner warmth in the bare winterscape. Hygge naturally complements our society’s vision: bringing loved ones together in celebration. 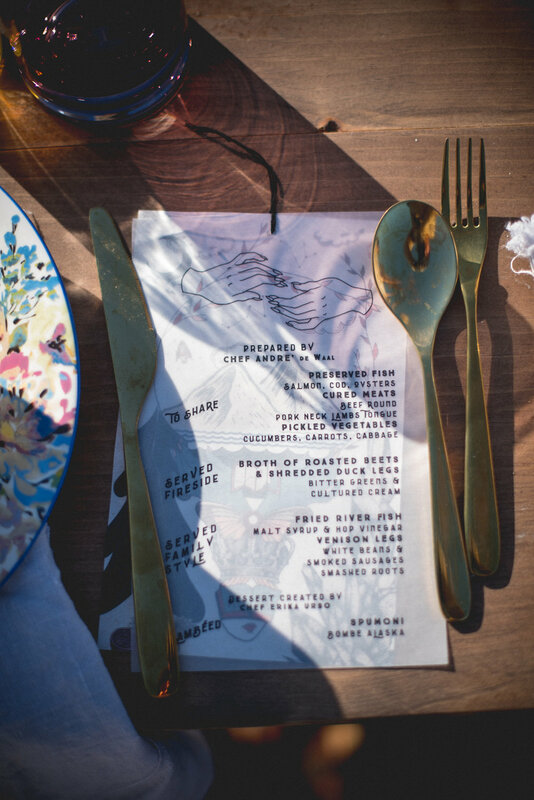 Starting with a carefully chosen group of individuals, we asked each guest to bring something special and unique. 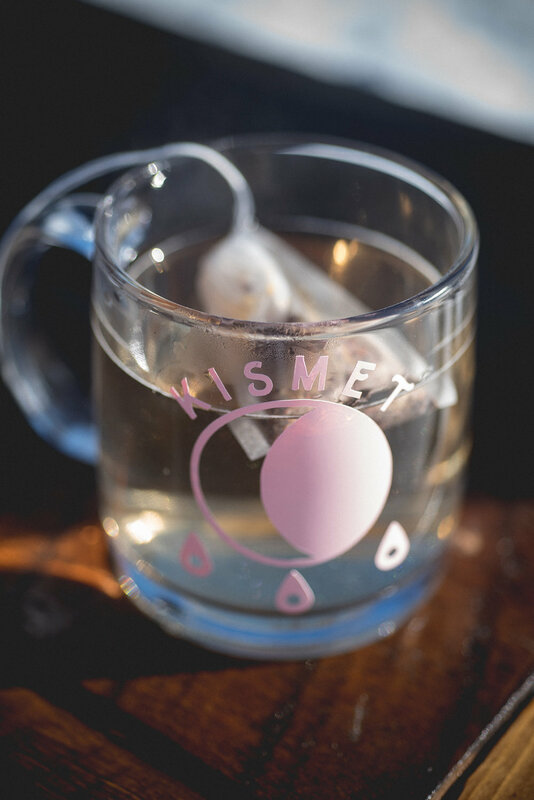 This generous outpouring manifested in countless magic gifts and moments — from glass mugs by Rabbit Rabbit Crew featuring the world “kismet” to steaming hot, glittery pink tea by Coco Love™. We asked each collaborator to choose something that incorporated their talents, generously caring not only for those around them but also for themselves. The morning of the Ice Dinner, I checked the weather and was excited to find that the high would be topping out in the mid-20s. The winter was welcoming us with open (albeit windy) arms, and now all we had to do was let our guards down, celebrate, and elevate what was available to us, making it beautifully our own in the process. 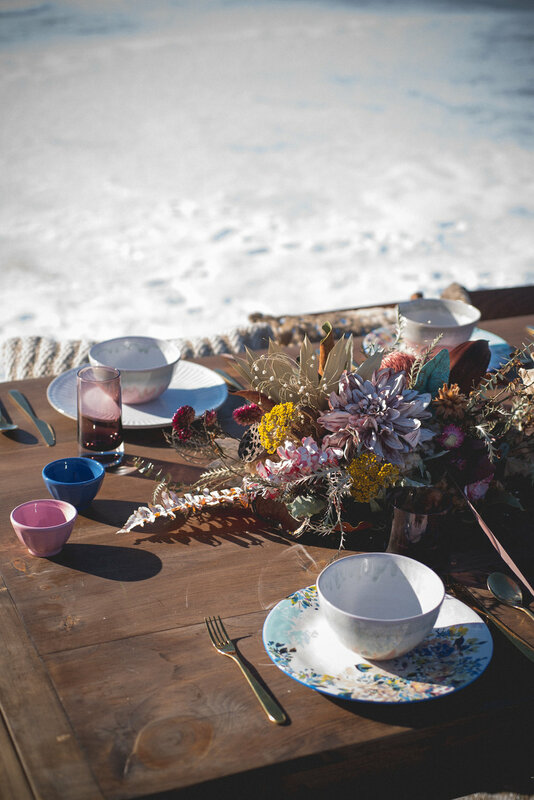 A huge number of people came together to bring The Bacon & Lox Society’s dream to light, beginning with Forget-Me-Not, who filled our barren space (nestled over three feet of ice) with beautiful vintage tables and upholstered chairs. Some of our guests brought lush oriental rugs, while others brought plush cushions and cozy wraps to make the lake more inviting. 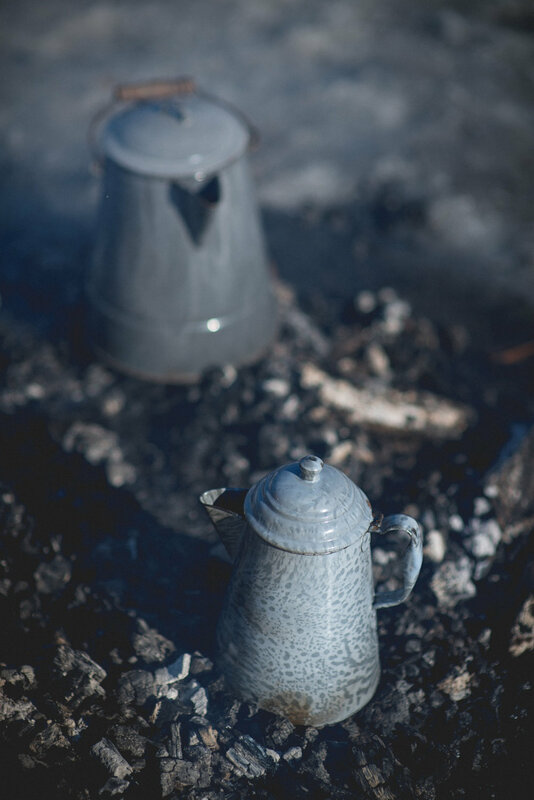 Once our group had gathered together, we gave toasts to celebrate “awareness and communal togetherness,” and built a bonfire by which we would warm ourselves. 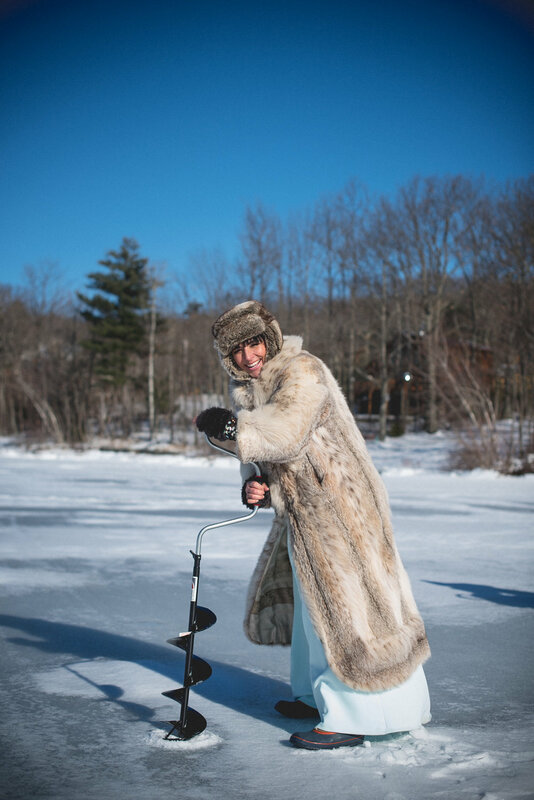 Photographer Rob Yaskovic captured the delicate beauty of the wintry landscape, along with portraits of our guests clad in sweeping dresses, furs, and winter hats. Next, we learned the art of ice fishing from a local expert — she beautifully embodied patience and willing bounty (even though we didn’t catch any fish). 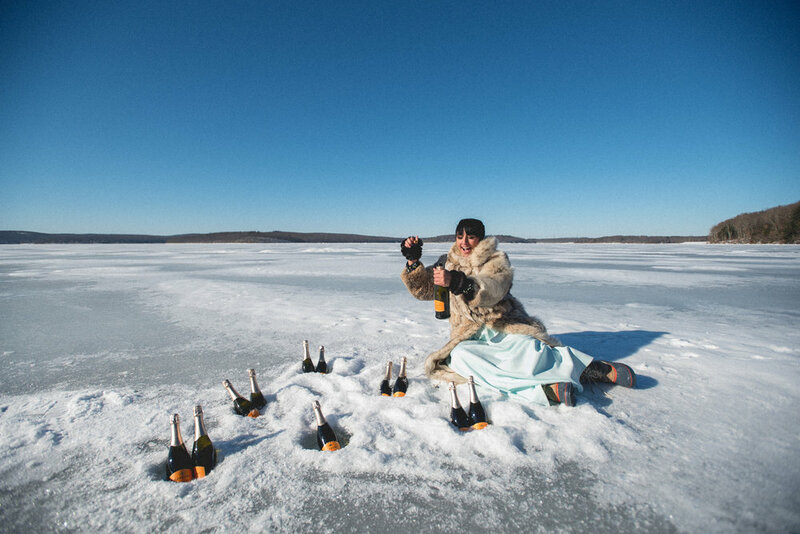 And we were delighted to find that the auger she used to make holes in the ice was the perfect size to chill bottles of champagne. 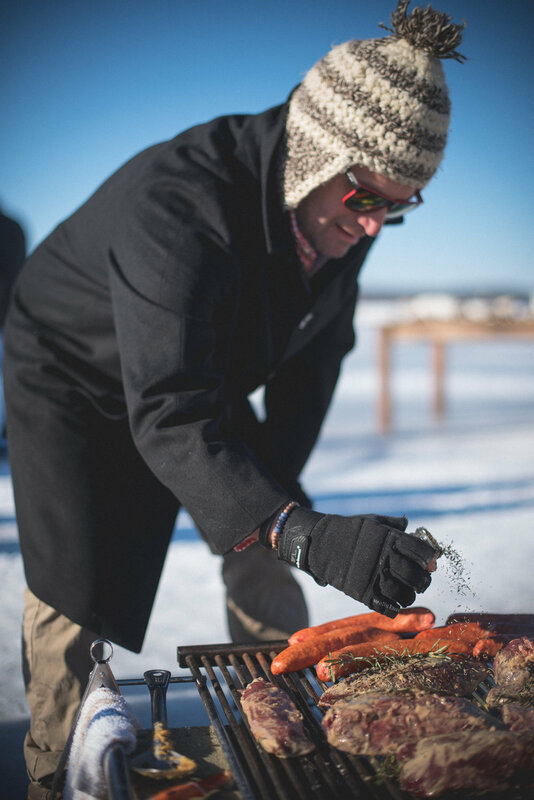 Chef André deWaal managed an incredible feat, beginning with his cooking station: a fire on the ice. 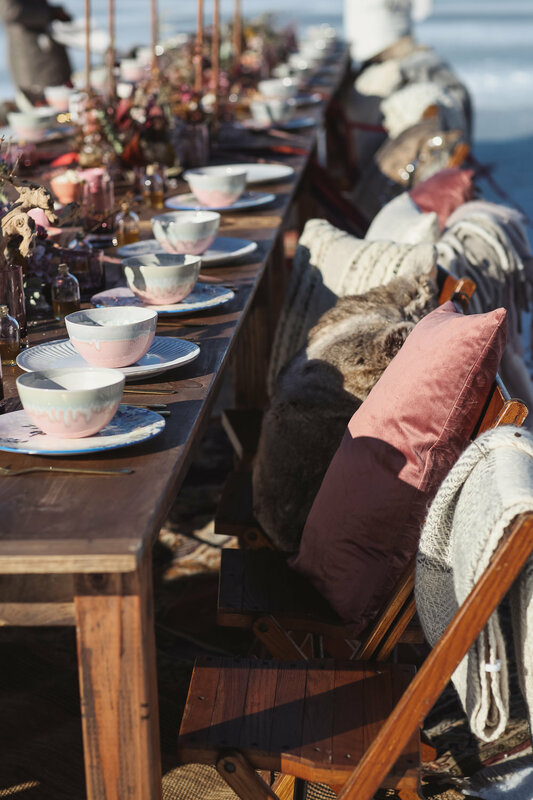 When it came time sit down and break bread together, we were delighted with beautiful platters and dishes carefully chosen by our most stylish friend Kelsea Gaynor (@eastolivia) of Anthropologie. Sarah Petryk created an incredible sense of place with her Allium Everlasting florals, featuring painted seed pods and other small items that highlighted the season’s unsung beauty. Dinner began with oysters and pickled vegetables, and next we dined on fried fish, venison legs, and bitter greens with cultured cream. Our feast featured a sweet ending created by pastry chef Erika Urso, a “Spumoni Bombe Alaska.” The soaring meringue peaks were a natural complement to the ice and snow around us. As the fire dwindled and we rubbed our cold hands together against the backdrop of a slowly setting sun, we found our conversations turning time and time again to what this event represented for each of us. Circling back to my initial thought, it forced us to ask: How can we thrive in difficult times? Isn’t this the best way to come out stronger on the other side, to learn the value of patience and always remember to shift your perspective? Eventually, the ice began to boom and crack around us as night fell; we knew it was time to head home. As I watch the days grow shorter and the leaves start to turn, I know that not only will I make it through another winter...but I’ll be concentrating on the things that make this time of year so special, reminding myself time and again again to be thankful for even the darkest days. These incredible individuals and businesses helped make the Ice Dinner as magical as it was.